Here's my WND column for this weekend entitled "Ten years and counting." April 30, 2018 quietly came and went with very little fanfare. The significance of this date even escaped me until earlier this week. That day marks the 10th anniversary of the very first time I saw my name associated with WND. What happened that day in April 2008 is WND gave me – a plain ordinary rural housewife with no political credentials, no platform, no following, no relevant educational background and no experience – the opportunity of a lifetime. They gave me a weekly column of my very own. I have no restrictions on what to write. I can write anything I please. There have been times I’ve touched on personal issues – anniversaries, birthdays, events on our farm, pet losses. There have been times I’ve discussed parenting issues – milestones in our daughters’ lives, homeschooling issues, career choices. There have been times I’ve tackled social matters that interest me – higher education, preparedness, feminism, simple living, farming, political correctness, faith, the decline of morality. And finally, when I can’t avoid it, I’ve tackled politics. I simply hate politics (go figure), so it’s a last resort as a column topic. So what’s it like writing a column? It takes some discipline. Invariably new columnists are full of brilliant ideas – I can talk about this! And this! And this! – and then the years go by and the brilliant ideas start petering out. After all, you have another column due next week. And the week after that. And the week after that. And the week after that. It’s relentless. And yet readers expect you to be brilliant, week after week. My admiration for syndicated columnists, who truly are brilliant week after week, knows no bounds. 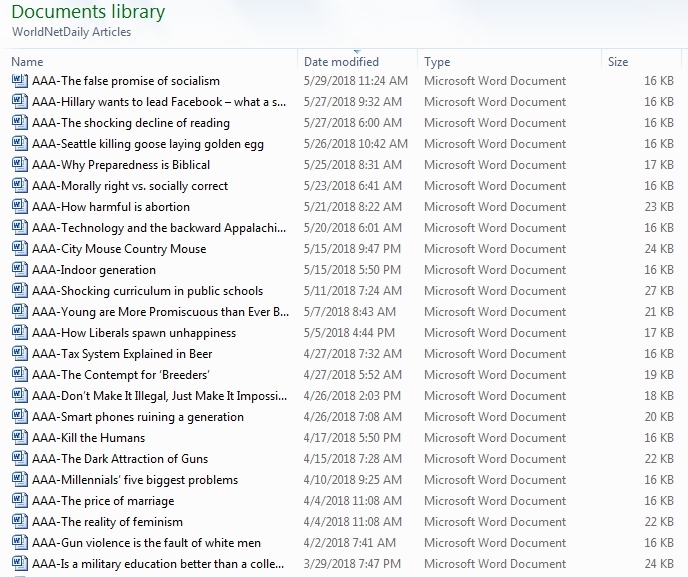 I’ve learned to keep a file on my computer with notes for possible future columns. Whenever I come across a link or a bit of info that might slot into one of those ideas, I copy it into the document. 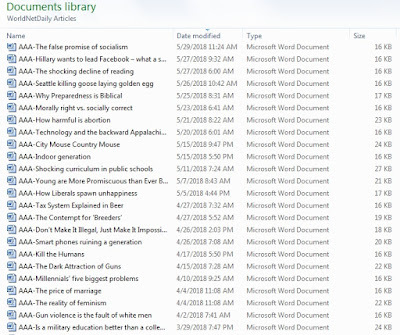 Most ideas never get developed into full columns – maybe it was just a passing news story or an ephemeral interest in some topic – so invariably the files start stacking up (right now I have over 600 undeveloped column ideas in my archive). Quite often (generally under the pressure of a deadline) I’ll start developing a column and it doesn’t “sing,” so I abandon it. Frequently if the week has been busy and I haven’t devoted enough time to it, the output is less than impressive – “Not a barnburner,” as my husband says. Speaking of whom, my husband is a full partner on these columns. He’s the news junkie, not me. Quite often, he’ll come in from the shop, boiling mad or laughing his head off over something he heard on talk radio. He’ll stand by my computer and “pontificate” (as he calls it) over what he heard, while I frantically type to transcribe his thoughts into a file. Many times, those thoughts become columns. This man is also a brilliant editor. He’s lousy at spelling and grammar but phenomenal when it comes to spotting holes or flawed logic or weak conclusions, stuff I can’t see since I’m too close to my work. And before turning in a column, I will read it out loud to him. Not only will this allow me to correct any spelling or grammatical problems, but it allows him to spot any other concerns that a silent reading might not have caught. Even as a very small fish in a big pond, having a column can become something in the nature of a fishbowl. People will read my weekly 1000 words and make wildly inaccurate assumptions about me. I’m either a champion of the distressed (I’ve received emails from perfect strangers begging me to take on their court cases) or I’m evil personified (hi Robert!). What a lot of people don’t “get” is I’m nothing more than what I’ve always claimed to be: an opinionated housewife with no political credentials, no relevant educational background and no experience. And of course most people – the vast majority of readers – are kindness itself, even if they disagree with some particular point I’ve made. Some readers have become friends, either in cyberspace or in real life. Our daughters (currently 22 and 20 and both out of the home) grew up with a mother who is a columnist, and long ago accepted being featured in this or that article. Over the years I wasn’t above capturing a conversation between them and featuring it in a column. I tried to safeguard our daughters’ privacy by refusing to ever name them, either in my column or on my blog. To all readers, they are simply Older Daughter and Younger Daughter. Perhaps this is less important now that they’re all grown up, but I felt strongly about it when they were minors. I’ve learned a few things about myself over the last decade. For one, I have more exposure to, and therefore less patience with, politics. Since we live on a farm and domestic life is my strength, it’s easy to ignore the swirling maelstrom of sewage that so often personifies the swamp in Washington. Writing a column forces me to cultivate awareness about national or world events I might otherwise have successfully ignored in favor of weeding peppers or picking strawberries or milking the cow. Through it all, WND has been a rock of support. Populated by some of the brightest minds in journalism, it offers a platform to those unbound by the chains of political correctness or liberal dominance. WND isn’t afraid to embrace matters of faith and religion, conservative and Constitutional foundations, and even to take a chance in offering an unknown rural housewife a weekly platform. In short, the chance to write for WND has enriched my life immeasurably. I’ve never regretted accepting the challenge of filling this column space, and I hope I’ve fulfilled the expectations of those who gave me that opportunity. And I thank you all, dear readers, for putting up with my weekly rambles. It is my hope that 10 years from now, I’ll be thanking you again. Patrice, you are a natural teacher. And you know that a picture is worth a thousand words. Your photos are awesome. Montana Gal and I have learned so much from your site. Thank you. Congratulations on 10 years, I think. Don't know how you do it. Congratulations Patrice! That is quite an achievement. 10 years, it's been that long already? I look forward to your column every Saturday, it's part of my weekend. Congratulations, Patrice, your influence reaches across this great nation and I'm a better man for it. I want to see the one "tax system explained in beer". I always go to WND site and then go to correspondents and then you just to let them know that someone likes your stuff. Congrats on 10 years. I haven't been around that full 10 but I do enjoy what I've read. "...yet readers expect you to be brilliant, week after week." So often, you are. Thank you. Congratulations indeed, Miss Patrice! Like Jeff from MS, your column is a cherished part of my weekend as well, a voice of homely sanity amid the din of screeching madness! While on the subject of writing I have thought for a long time that you and Don should write a book on the humorous side of homesteading. Some of your columns have been so funny, every time I think of it I laugh. Congratulations on your 10 year anniversary. Happy Anniversary! Your articles on WND are always thought provoking, and usually spot on with my way of thinking. I like that you have started sharing the text of your articles here. Congrats. WND is how I found the Rual Rev. I enjoyed and agreed with your articles so much, I wanted to know more about the author and in turn have fell in love with your Blog. Thank You! You're all family to me..